I am 5’7″ (1.68m) and have been this tall since I was 13. At 13 I weighed 49kg and maintained this weight throughout high school and into my twenties. As my then unknown intolerance to sucrose became worse my weight dropped to 44kg. I then went through a stage of weighing between 52 and 44 while the doctors and naturopaths tried to figure out what was wrong with me. As soon as my blood sugar levels stabilized so did my weight. I gained a bit when I gave up smoking and lost a bit when Dave moved to Gordons Bay before I did. But then after the move and a wedding, I was a happy 54kg. Content and lax, this winter has been a shocker. Despite losing weight in France I am now close to the chubbiest I have ever been, and I know I am not fat! But I don’t feel comfortable and so it is diet time for me. My new routine is my resolution for 2012! It has been going on for two months already. I will gym everyday I can and I will start with small steps – 20 minutes of cycling until I’m back to 1 hour of training a day. I will walk more and I will pay attention to my treats. No more milky coffees, no more sandwiches and no cake. I’ll go back to being good for 5 days and letting go on the weekends. I need to be fit and feel better before we leave on our annual holiday. At the same time I am doing my own ‘no red wine and no cheese diet’, Dave is on a restricted carbohydrate diet. For both of us, the diet is working and it is not hard work. We have both lost weight and feel great. But, with no pasta and no potatoes 5 days a week, each pasta dish has to be something special. I can promise, this one is. Good luck on your 2012 resolution. It sounds like you are off to a great and rewarding start. I may add that when the sauce is satisfying, a small portion goes a long way. Thank you for contributing to Presto Past Nights! Kudos to you on losing weight, that’s my eternal battle. I love your rationale of 5 days of goodness and then allowing yourself some treats on the weekend. I will try that! Mmm, that sauce certainly does sound like something special! I rarely eat pasta–but I bet this would be equally amazing over quinoa or a pile of roasted veggies. Ooo, I look forward to hearing about it! Thumbs up for healthy living! Good for you Tandy! 🙂 love the pasta sauce. 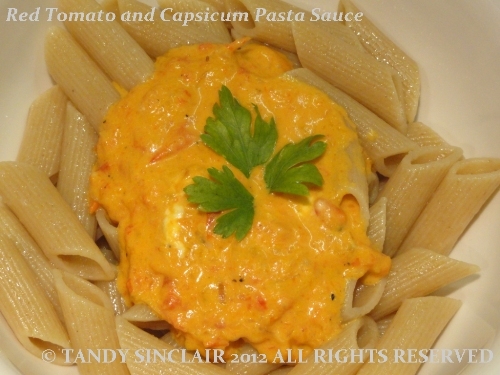 The pasta looks delectable, and the sauce…mmm..it’s just flavourful and tasty. This pasta looks great and I’m sure you do too. That sauce looks so creamy and delicious – almost as if it has cream in it, so it’s good to know that really it’s so healthy. I remember when I younger it was so easy to lose weight when I put it on but now I seem to creep up by about half a stone every five years! agreed, although the feta is always mighty tempting and the lettuce less so! I too am trying to reign in the bad eating habits by cutting out the evening carbs, although it has been my very early teens since i saw any figures in the 50’s on my scales! Probably why i threw them out! I’m on a diet too, but it isn’t working too well 🙁 Keep on the good job! I am the same height. I know that I’m not overweight also, but there comes a moment when you realise that you’re not moving up stairs as easily as you might do, and that’s when I cut back. When I turned 60, the weight seemed to think it should just stick around no matter what I did or didn’t eat. Metabolism. Pshaw. Tandy, great idea to make every bite count. I think sometimes I forget what I am eating and need to slow down and appreciate each bite even more! Hi Tandy this recipe sounds wonderful & good luck with the “new lifestyle change” baby steps are the way to go. This sounds absolutely delicious!!!! A great way to enjoy a simple yet special pasta! where are you and Dave going this year?